Dr. Joan Alvarez was born and raised in the Dominican Republic. At a very young age, he knew he wanted to follow in his father’s footsteps and become an OBGYN. 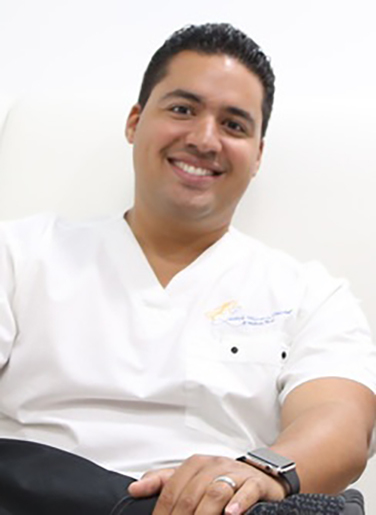 After earning his medical degree from Pontificia Universidad Católica Madre y Maestra in Santiago, Dr. Alvarez gained extensive experience working alongside his father, Dr. Francisco A. Alvarez D ’Oleo, before pursuing his dream in the United States. Dr. Alvarez completed his obstetrics and gynecology residency at Yale-New Haven Health/Bridgeport Hospital, which is affiliated with the Yale School of Medicine. Throughout the years, Dr. Alvarez has taken his passion and dedication for medicine to remote and underserved areas on Honduras and the Dominican Republic, working alongside world-renowned surgeons in volunteer trips with the US Agency for International Development (USAID), Heart to Heart Mission, and the International Children’s Heart Foundation. With his strong surgical background and excellent gynecologic minimally invasive/robotic surgical skills, Dr. Alvarez received the American Association of Gynecological Laparoscopists (AAGL) "Recognition of Excellence in Minimally Invasive Gynecology" award and was elected to become a member of the AAGL in 2015. He is also a member of the American Medical Association. Dr. Alvarez is board certified by the American Board of Obstetrics and Gynecology and a fellow of the American College of Obstetrics and Gynecologists (FACOG). Dr. Alvarez joined Levin’s Women’s Health in 2015 and has since been serving patients in the Miami area. He is fluent in both English and Spanish. To schedule a consultation with Dr. Alvarez, call Levin’s Women’s Health & Wellness Center in North Miami, Florida today at (305) 981-0231 or you can request one online.